Government and individual policymakers throughout the developed and developing world face the common problem of bringing expert knowledge to bear in government decision making. Policymakers need understandable, reliable, accessible, and useful information about the societies they govern. They also need to know how current policies are working, as well as possible alternatives and their likely costs and consequences. This expanding need has fostered the growth of independent public policy research organizations, commonly known as think tanks. 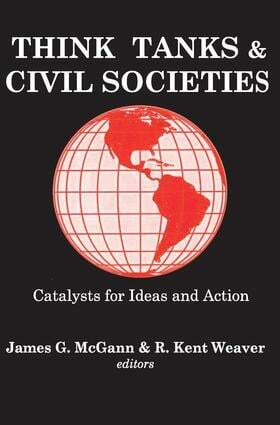 Think Tanks and Civil Societies analyzes their growth, scope, and constraints, while providing institutional profiles of such organizations in every region of the world.Beginning with North America, contributors analyze think tank development past and future, consider their relationship to the general political culture, and provide detailed looks at such examples as the Heritage Foundation and the Institute for Research on Public Policy. A historical and subregional overview of think tanks throughout Europe notes the emphasis on European Union issues and points to a dramatic rise in the number and influence of free market institutes across the continent. Think tanks in Germany, Spain, and France are profiled with respect to national politics and cultures. Advanced industrial nations of northern Asia are compared and contrasted, revealing a greater need for independent policy voices. Moving to countries undergoing economic transition, contributors deal with challenges posed in Russia and the former Soviet bloc and their think tanks' search for influence, independence, and sustainability. Other chapters deal with the developing countries of Africa, Asia, the Middle East, and Latin America, finding that the number, quality, and independence of think tanks is largely determined by the degree of democracy in individual nations.